EverEdge is a company we find ourselves working with on nearly all of our projects in one guise or another. Their products are incredibly versatile and their application can make a huge difference to the maintenance of a completed garden. In its Classic form, EverEdge™ can be used to edge lawns, paths and borders; we tend to specify the product in brown which means once installed it’s virtually invisible and all that can be seen are the crisp lines and junctions it creates. The product is a powder coated steel strip of varying lengths and thicknesses with toothed spikes along the bottom edge. The strips interconnect and can be sprung into smooth curves or anchored to form tight corners and junctions. Used in heavier weight gauges and deeper sections the product can be used to create retaining edges or raised planting areas with the same fluid lines possible with the edging product but with the minimum of structure. 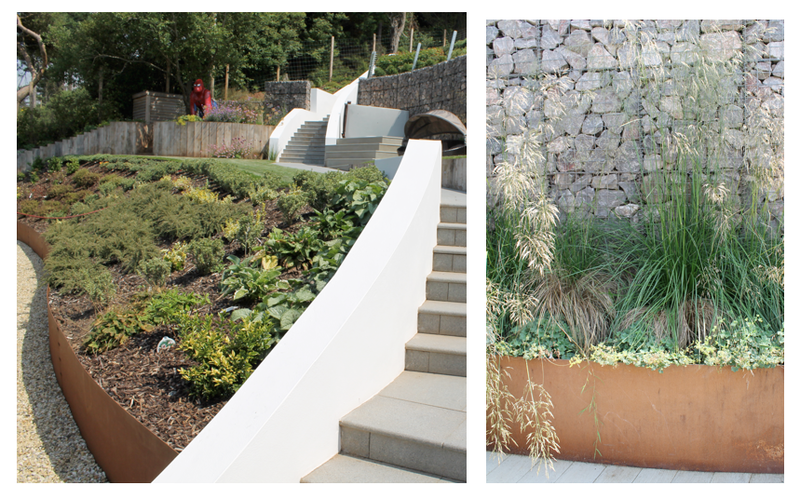 We had some special sections made in Corten™ steel to create curved retaining edges over 500mm high.